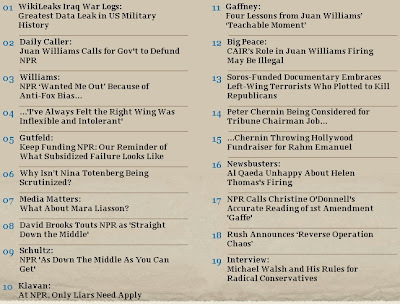 The Midnight Review: Is NPR The Right's New ACORN? If you haven't heard, Juan Williams from NPR was recently fired for comments he made while on Fox News. "When I get on a plane," he said, "I got to tell you, if I see people who are in Muslim garb and I think, you know, they are identifying themselves first and foremost as Muslims, I get worried. I get nervous." Subsequently, NPR had received a lot of criticism for their actions. NPR had claimed the firing was not because of his recent statements and that Williams has become more of a pundit and less of an analyst - Bill O'Reilly believes he was fired because he is a Fox News contributor, and now that Williams no longer works for NPR, it appears he has found a home on Fox News - he just signed on for an expanded roll with the conservative media giant. Personally, I think there has been a bit of an overreaction to Williams' comments, but I do agree that Williams' comments and his constant appearances on Fox News could potentially raise questions regarding NPR's objectivity. What I have noticed about this incident is that conservatives are using this controversy as an opportunity to attack the left on multiple fronts, with legislators and conservative celebrity personalities calling to defund NPR - something they tried to do 20 years ago but failed to do. To conservatives, NPR is nothing more then a bastion of liberal propaganda - they are probably upset that the media organization has some of the most popular radio broadcasts in America and were once voted the most trusted news source in America - an honor Fox News or Andrew Breitbart will never see. Studies have also howed that there is plenty of conservative programming - NPR is typically ranked more liberal then the average Republican and more conservative then the average Democrat, and viewers generally havea better understanding of the news and current events then those who obtain their information from network or cable sources. The problem with conservatives is that recent attacks against NPR are highly political and equate to nothing more then propaganda - they need a new bogeyman now that ACORN is gone. 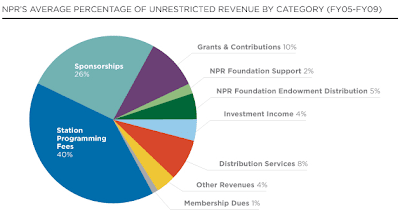 Let's take a quick look at NPR's funding. Conservatives call for the end of government contributions as if the government is spending another $700 billion but in reality, the amount is far less - according to Wikipedia, their 2005 budget was closer to $100 million. Basically, NPR receives no direct funding from the government. The largest share of NPR funding comes from its member stations (including WBUR). NPR does receive grants from CPB for special projects, but that funding is not included as part of the network’s operations budget. So while federal dollars do flow to NPR, the connection is indirect. It may be a fine point, but it’s an important distinction. The federal government can’t “defund” NPR. What Congress can do is cut CPB funding — which has diminished over the years and has, at times, been threatened. But those CPB funds play a minor role for a large-market station like WBUR (around 6 percent) and represents a much higher percentage for a station in a smaller market, such as Wyoming and Idaho. 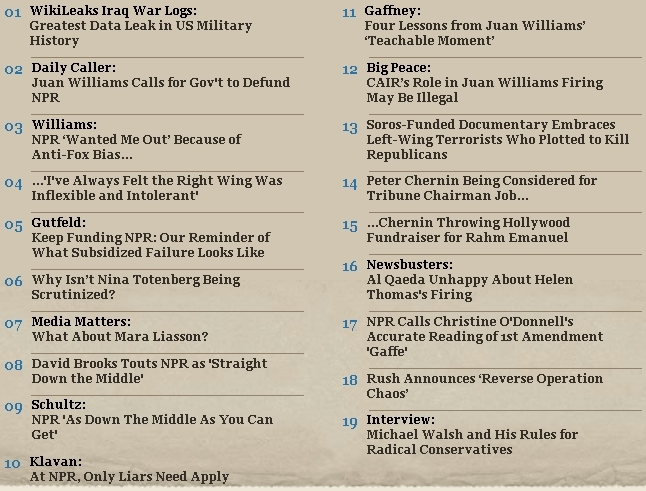 Now taking that into consideration, I had decided to check out Breitbart's Big Journalism because I thought they must be having a field day with the Williams' firing and I was correct - over half the headlines on the site were about NPR and Juan Williams, as well as numerous articles on the site. Basically, since the right succeeded in the character assasination of ACORN, they needed a new target and NPR was ripe for the picking.